Phthalates are high-production chemicals used widely in polyvinyl chloride (PVC) plastics. These are materials used to produce children’s toys, blood-storage containers, medical tubing, and plastic packaging films and sheets, among others. Phthalates make plastics more flexible and harder to break. There are several different kinds of phthalates, but all of them are referred to as “plasticizers”. Some phthalates are used as solvents (dissolving agents) for other materials. Numerous animal studies revealed evidence of adverse reproductive and developmental effects after exposure to phthalates, which makes pregnant and breastfeeding mothers most vulnerable to this toxic chemical. Some of the major toxic effects include fetal malformations such as cleft palate, and abnormal sexual differentiation, among others. Phthalates are not known to irritate the eyes and the skin, although most cosmetics containing this chemical have been banned in the EU for its potential carcinogenicity and endocrine disruption in humans. Some studies of phtalates exposure with rodent models resulted in adverse liver effects including increased liver weight and some cases of tumor. Phthalates are used in adhesives, building materials, cleaning products such as detergents, insecticides, lubricants, medical devices, solvents, plastic plumbing pipes, wood finishes and vinyl flooring (to name a few). Products containing phthalates have been banned for cosmetic use in the EU, but it remains prevalent in the U.S. Some of these products are: perfumes, soap, fragrances, lotions, body washes and hair care products, and nail polish and treatment. 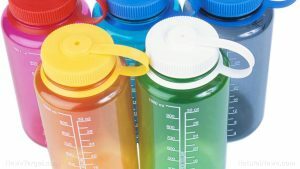 Phthalates are present in many different objects and products, so avoiding it entirely is a stretch. However, you can reduce your exposure by choosing alternative products over those made with phthalates. Avoid plastic as much as possible, especially heating food in plastic containers as phthalates can seep into the food. Phthalates are used in pesticides which can then enter commercial produce and other foods. Opt for organic produce such as those grown at home or your local farms. Choose perfumes with labels indicating “no synthetic fragrance” or “scented with essential oils” over those with “parfum” in the ingredients to avoid phthalates. You can also check for its other names such as dibutyl phthalate and diethyl phthalate. Phthalates are commonly used in the production of medical devices such as IV bags. If possible, ask your healthcare teams to use phthalate-free (non-PVC) tubing and IV bags. Phthalates are high-production chemicals used widely in the production of polyvinyl chloride (PVC) plastics. PVC plastics are then made into various objects such as children’s toys and medical devices like IV tubing. Phthalates are present in insecticides, cleaning products, lubricants and solvents, as well as cosmetic products such as perfumes, and hair care and skin care products. Phthalates are major reproductive and developmental toxicants. Pregnant women and lactating mothers are the most vulnerable when exposed to products containing phthalates. Phthalates are potentially carcinogenic to humans and a known endocrine disruptor.